Hint: It's not through its sports apparel offerings. Nike (NYSE:NKE) is the biggest seller of athletic apparel and footwear in the world. It owns one of the most valuable brands on the planet, and in its last fiscal year, the company generated a record $3.8 billion of earnings from sales of $32.4 billion. Below, we'll look at how this industry giant produces the majority of those healthy profits. Nike does business in nine product categories, including those that specialize in activities like basketball, soccer, and running. It generates most of its annual sales through footwear, though, with help from massive franchises like the Jordan brand. The company has a dominant position in running shoes, too, with the segment rising 10% last year thanks to its popular Pegasus franchise. Footwear accounted for $20 billion, or 61% of Nike's $32 billion of revenue in fiscal 2016. Footwear is a lower-margin business compared to apparel, and that helps explain why Nike has a weaker profit margin than Under Armour (NYSE:UA) (NYSE:UAA). After all, its smaller rival produces just 20% of its revenue through footwear sales, which has allowed it to post consistently higher gross margins. Yet that gap is shrinking over time as Under Armour pushes deeper into the footwear business. 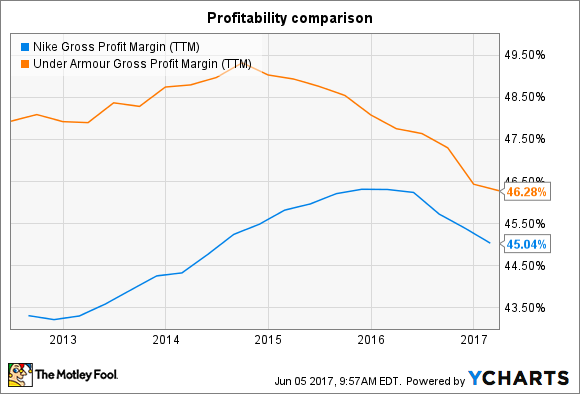 NKE Gross Profit Margin (TTM) data by YCharts. With respect to sales channels, most of Nike's revenue comes from its wholesale customers who distribute its products through a vast network of retailers. This setup has its weaknesses, and lately the biggest has been slowing shopper traffic in the U.S. market. CEO Mark Parker blamed that consumer shift for pushing growth numbers down to a crawl there over the past nine months. Executives are pouring resources into their direct-to-consumer sales channel in response -- and that segment is up 20% so far in fiscal 2017, compared to a 4% boost for the wholesale divisions. However, the direct channel is still responsible for just 28% overall brand sales. Most of Nike's revenue, 53% to be exact, comes from international markets, which leaves the U.S. accounting for a bare minority, 47%, of sales. The strong diversification (Under Armour counts just 15% of sales from outside the U.S.) has served Nike well recently. Yes, its growth pace has slipped, adding to a pessimistic reading on the stock by Wall Street. Its last few quarters were closer to 5% gains than the double-digit boosts that shareholders enjoyed as recently as 2015. However, Under Armour has seen a much sharper slowdown because of its reliance on the U.S. market. The struggling sports apparel retailer recently posted its first quarter of sub-20% sales growth in almost seven years, and management now expects to log declining profitability in 2017 even as sales growth dives to a 12% pace from 22% last year. Nike's rebound plan starts with increased innovation that protects its products from retailer price-cutting. Parker and his executive team see plenty of room to improve on this score, including by simplifying the portfolio and speeding up the development process. Nike will also plow resources into the online sales channel to help offset lost revenue from the shift away from brick-and-mortar shopping. Nike's huge annual marketing commitment will be a key asset in this market-share fight. The retailer last year invested over $3 billion into what management calls "demand creation expenses." These include advertising and branding strategies around major international sporting events. Few rivals can come close to matching that outlay, and that advantage adds to Nike's brighter growth outlook.